"You know, you're not 56 any more!" If you've read much or any of the other annual journals on this website you know that one of Jim's and my favorite inside jokes over the years is, "Well, you aren't 35 any more." It's a wry observation when one of us whines during a run, hike, or bike ride because it's hard, or we're really sore the next day. It clearly means, "What the heck did you expect at your age??" Today's hike in the Presies was tough. After struggling up and over rough, rocky footing for a couple hours I suddenly said out loud to myself, "You know, you aren't 56 any more! What the heck did you expect??" That just cracked me up enough to laugh out loud and have more fun the rest of the way to the summit! Views like these make it all worthwhile to me. Look at the layers of blue ridges in the distance! 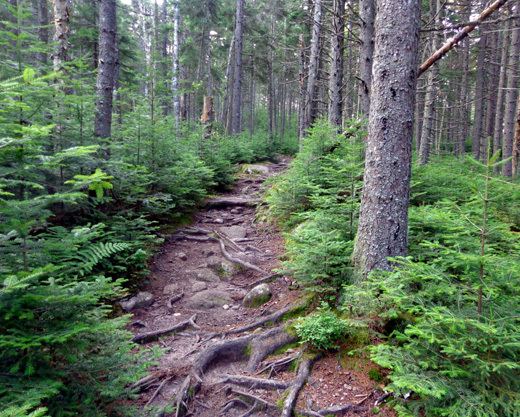 I stopped grumbling and kept thinking how grateful I was that, at age 65, I was still able to get up above treeline and hike these gnarly trails, even if I wasn't moving as fast and easily as nine years ago when I did the Appalachian Trail Adventure from Georgia to Maine. Come to think of it, I did my share of whining then, too, remembering how fast I could have done it when I really was only 35 . . .
YOU DIDN'T WASTE ANY TIME, DID YOU? That was the surprised response I got from our younger friend, Eric, who we've known since the end of our A.T. Adventure in 2005. 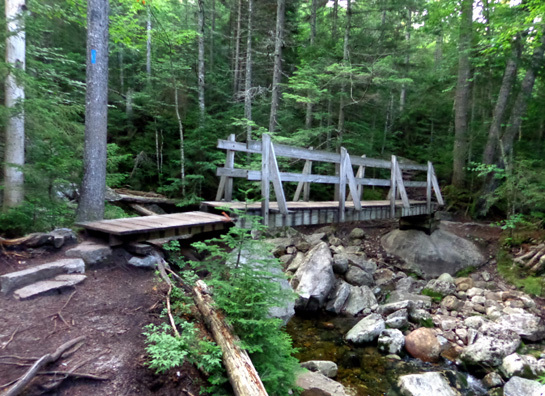 He lives in Maine on the eastern side of the Whites and knows all these trails like the back of his hand. We've been in contact this summer because we plan to get together with him and his wife a couple times while we're nearby. Eric knew I wanted to hike up to Washington's summit again but thought I'd work up to it a bit more gradually by doing some easier hikes first. Ha! First full day in the Whites and I tackled Washington, the highest peak -- with the worst potential weather -- in the Northeast!! 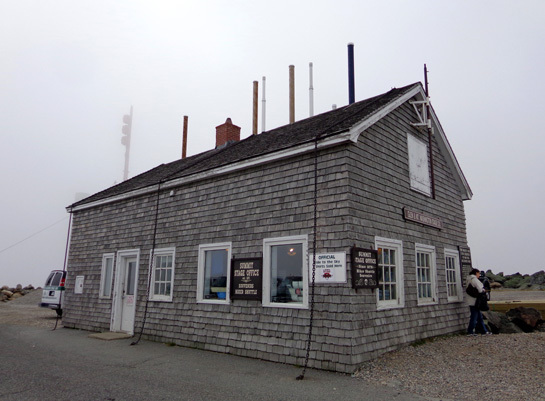 Above and below: Note the iron chains bolting the summit stage office to the ground! I admit I wasn't fully trained for it but I saw a short, sunny weather window and decided to take advantage of it today. [At this point we didn't know we'd be here two weeks instead of one.] 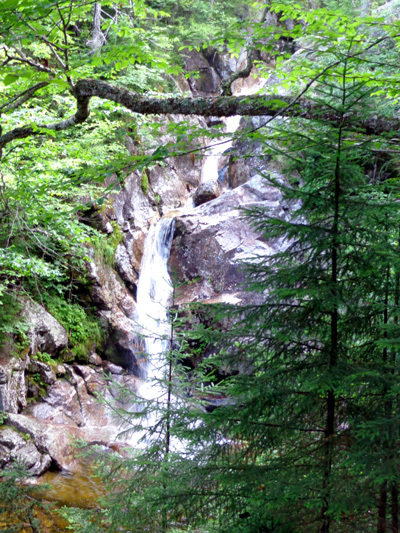 Climbing this mountain again was my Number One priority during our stay in New Hampshire. So, no, I didn't want to waste that opportunity. Yes, despite sub-optimal training. Determination (hard-headedness?) goes a long way. I've made it up and down much higher peaks in the Rockies with about the same proportional training as this. Not all of my route was the same today as it was during our A.T. Adventure. 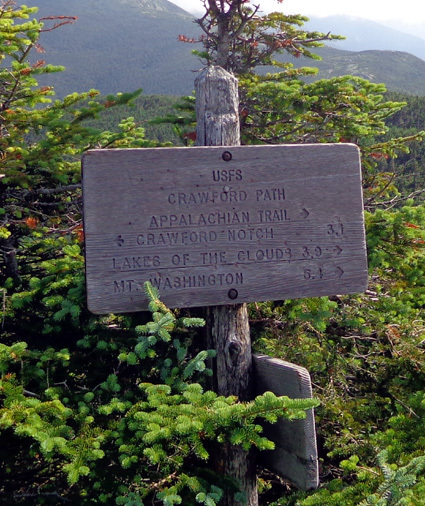 Back then, on Day 120 (August 27, 2005), I covered 12.6 miles going northbound from Crawford Notch/US 302 to Washington's summit, crossing over or contouring around Mts. Jackson, Pierce (AKA Clinton), Eisenhower, Franklin, and Monroe en route to Mt. Washington. I didn't think I'd be able to go that far today in daylight so I figured out a way to shorten the route by about four miles. 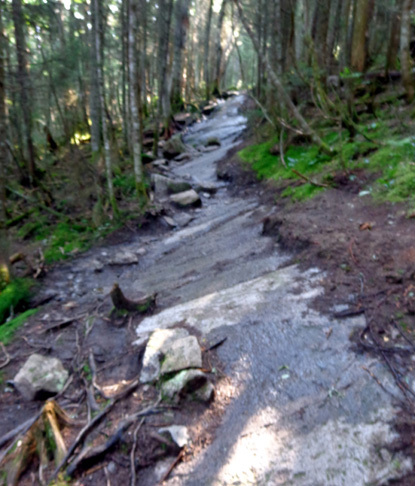 There are several side trails up to the ridge and I used one of those. I didn't go over Mt. Jackson this time, the most southerly Presie peak, and I came out on the ridge a little past the summit of Mt. Pierce, the second peak heading north. 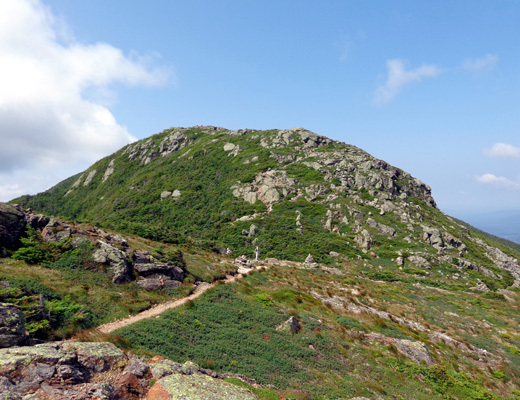 I began hiking at 7:30 AM and took 6:23 hours to walk 8.43 miles over predominantly rocky, rooty terrain with 5,197 feet of elevation gain and 894 feet of loss. 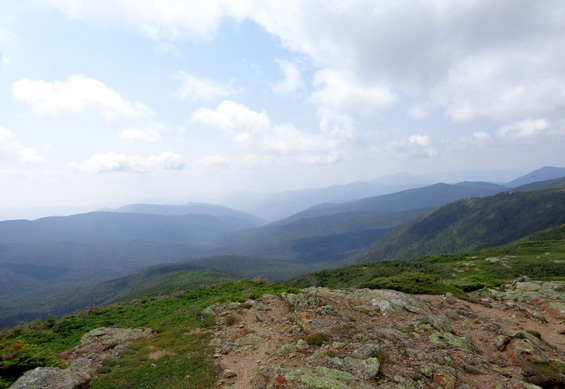 The elevation gain and loss would have been even greater if I'd gone over the tops of Mts. 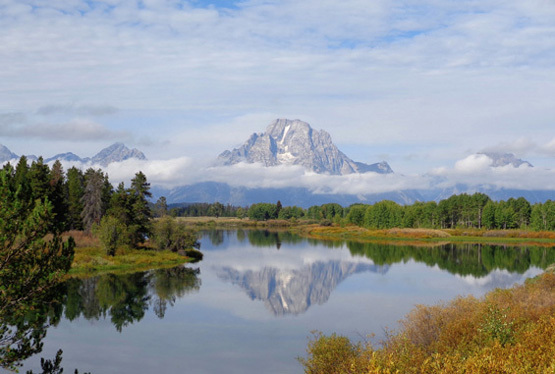 Pierce, Eisenhower, and Monroe instead of following the A.T. around and a little below their summits. I did hit the high point on Mt. Franklin. 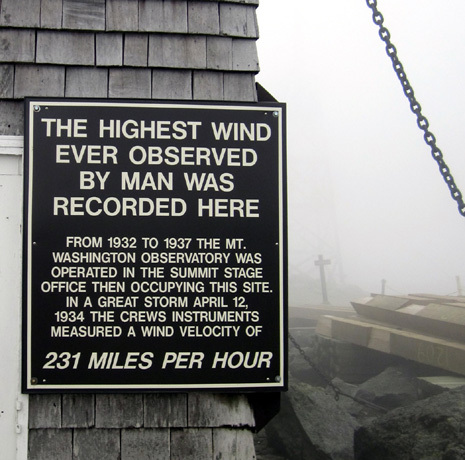 My lowest point was 1,902 feet at the trailhead and the high point was 6,288 feet on Washington's summit. Close to, but not over, Mt. Monroe: contouring around the NE side of the mountain. 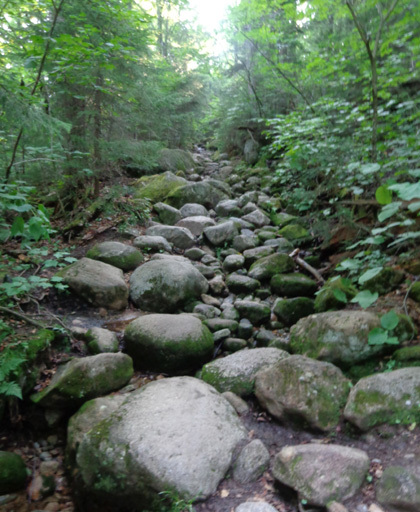 This was a special hike for me and I took over 300 pictures; Jim also took some photos. I'm including over 60 of them here, spread over two pages so they are easier to load. The first third of this hike was new to me. Jim drove me to the Crawford Path trailhead on Mt. Clinton Rd. 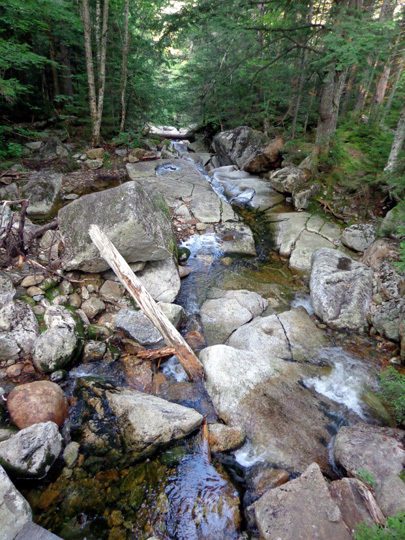 in Crawford Notch, a little over eight miles south of the US 3/302 intersection at Twin Mountain. 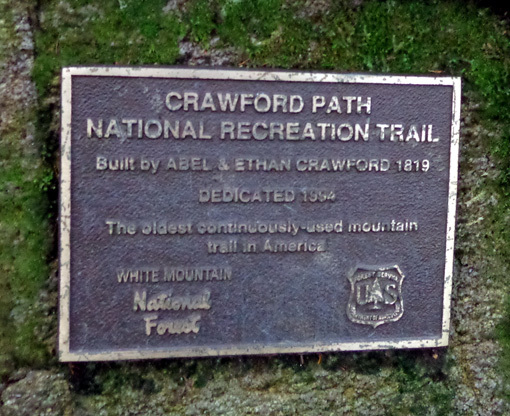 The old Crawford Path, which was built in 1819, begins on US 302 but there is no parking at that location. I hiked a 4/10ths-mile connector to the main Crawford Path. 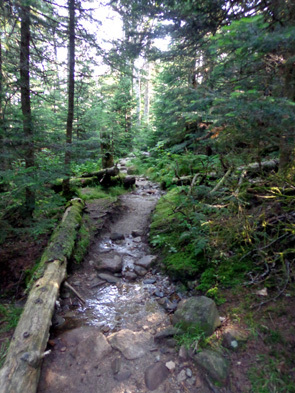 The rest of my route was on the A.T., which runs contiguously with the Crawford Path to Mt. Washington. The connector path is marked with blue blazes (can't see them here) and is full of roots. 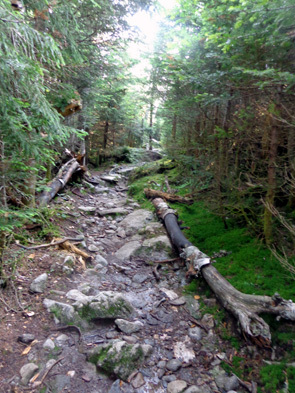 Then I followed the main Crawford Path for about 2� miles on the western side of Mt. Pierce to the ridge connecting the southern Presie peaks. 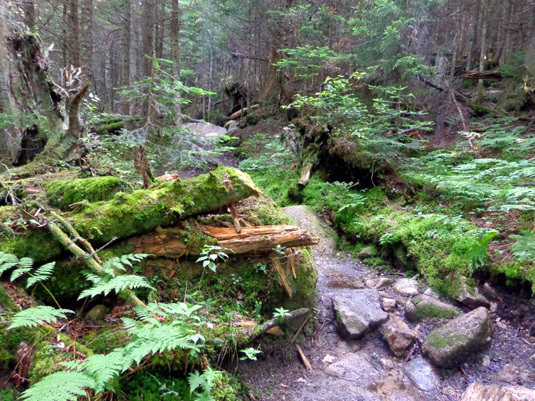 The flora morphed as I climbed higher and higher, with beautiful evergreens, birch trees, ferns, flowers, and moss that reminded me of what I saw in the rainforests of South Central Alaska two years ago. In the Whites, evergreens (white pines, red pines, hemlocks, etc.) and mixed hardwoods (birch, maples, oaks, beech trees, etc.) 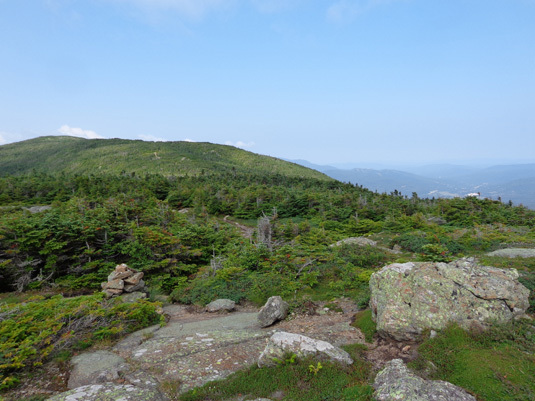 abound below elevations of 3,000 feet. 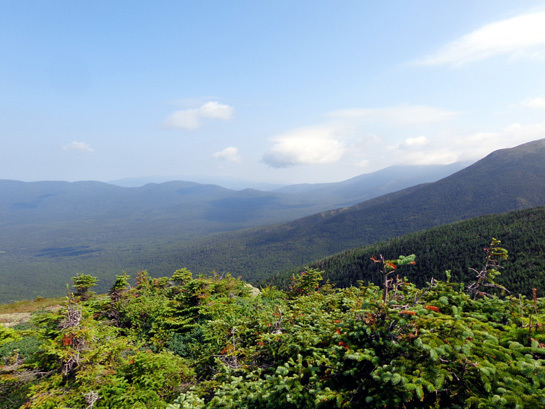 Boreal forest with birch, spruce, and fir trees predominate from about 3,000 feet to the timberline. Moss covers everything that doesn't move. 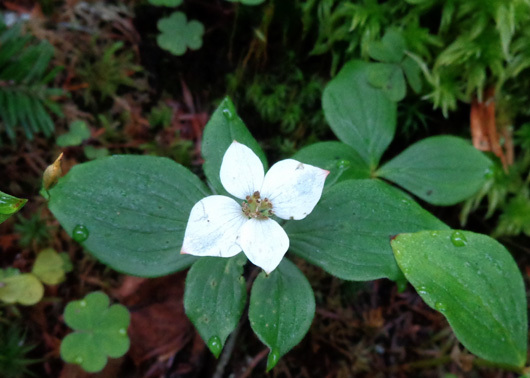 Bunchberry flowers resemble dogwood blooms. These were at about 3,500 feet. 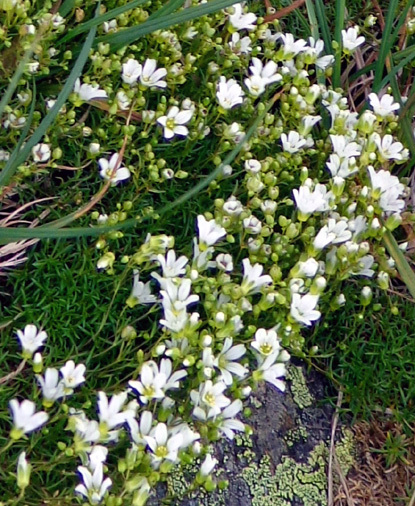 These little alpine flowers were growing above treeline at about 5,500 feet. 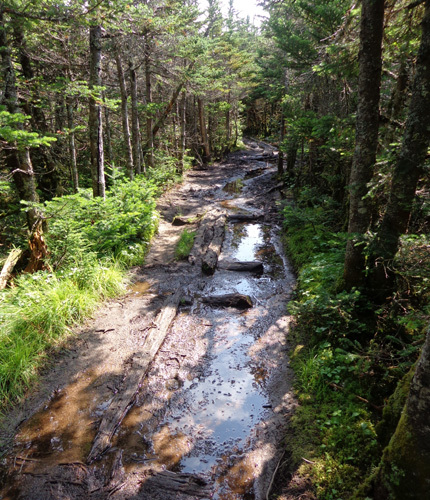 The trail was very wet, sometimes resembling a creek, but thankfully most of the rocks were dry today. I discovered how treacherous they can be during the sleet storm I encountered on Mt. Madison, just north of Mt. Washington, on Day 121 during the A.T. Adventure. 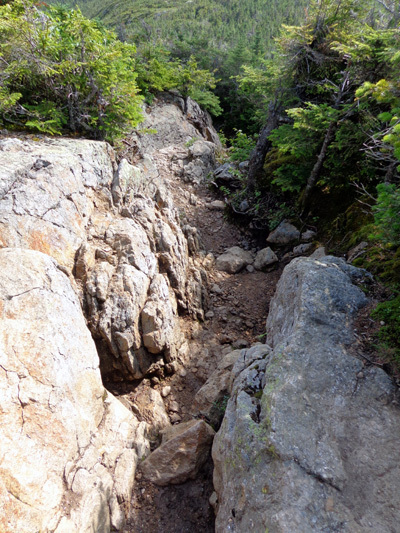 Smooth, slanted bedrock like this is treacherous when wet or icy. I hiked for almost an hour without seeing a soul. Before the intersection with the cut-off for the Mizpah Springs hut I saw about a dozen hikers descending the mountain. They said they spent the night at the hut. 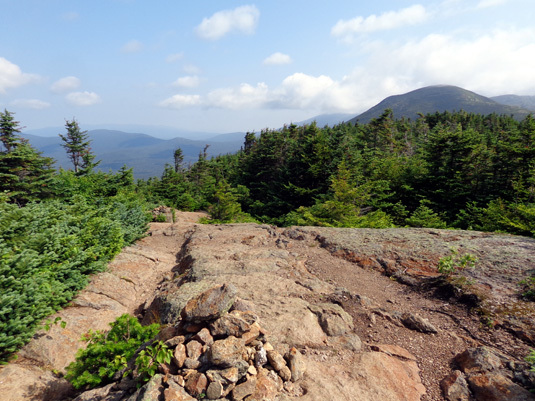 I continued left on the main Crawford Path, contouring gradually up the northwest side of Mt. Pierce to the ridge. The trail remained treed and I didn't see anyone else for another hour. It was 2.87 miles from the parking area to the junction on Mt. Pierce where the A.T. runs contiguously with the old Crawford Path. The elevation at that point was 4,220 feet and I was still in some low trees. 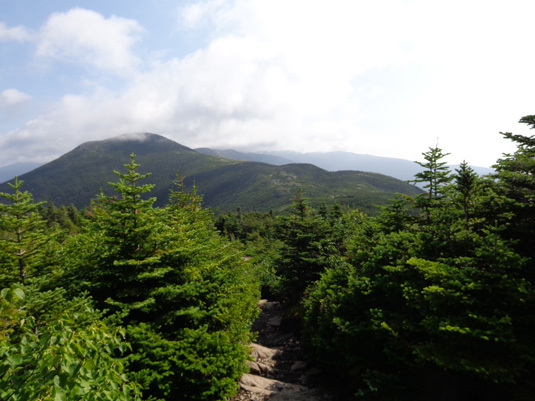 I could finally see down into Crawford Notch (the valley) briefly near the intersection with the A.T. on the north side of Mt. Pierce . . .
. . . but soon descended into taller trees and didn't have great views again until I started climbing up Mt. Eisenhower. That was the pattern all along the ridge -- awesome panoramic views above treeline when I was near each of the southern Presie peaks and down into the trees again between each of them. with bog boards in various stages of deterioration. I thought following the A.T. would be more intuitive than it was so I didn't bother reading my old guide before this hike, just my 2005 web journal. 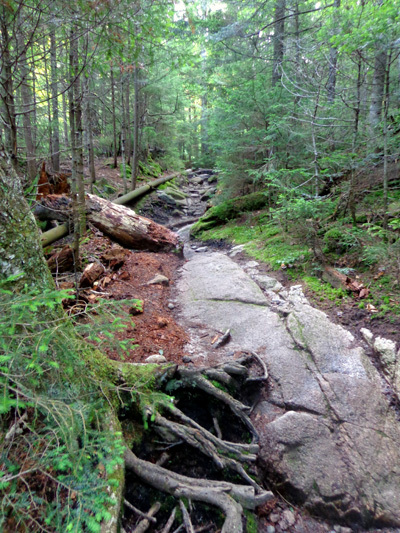 I forgot that New Hampshire uses old trail names and has few white A.T. blazes. 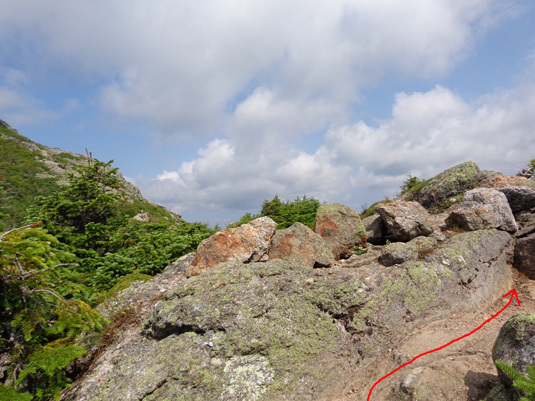 My first question was the intersection with the trail that goes up and over Mt. Eisenhower -- was I supposed to stay on the Crawford Path and contour around the east side of the mountain just below the summit or go over the top? I just kept following the Crawford Path after I got up on the ridge, which I believe is what the A.T. does from the north side of Mt. 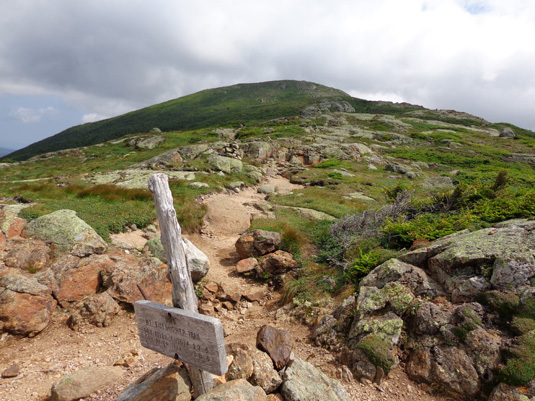 Pierce to Mt. Washington. 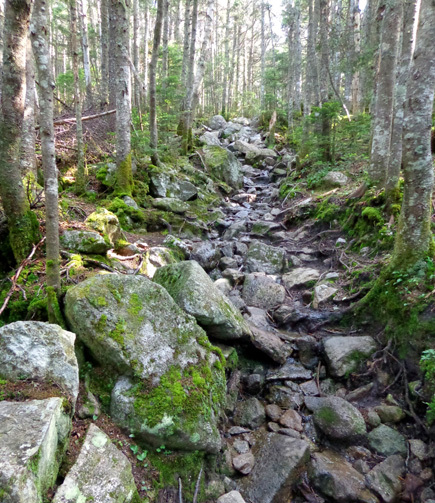 A couple signs said "Appalachian Trail" and occasionally I'd see a white blaze on a tree or rock. Note the rock cairn on the left. I didn't worry at all about getting lost. 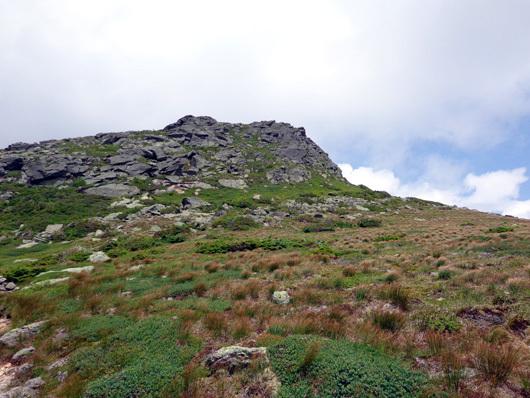 All I had to do was stay on or near the ridge and aim for the next peak to the north! In retrospect I would have had better views if I'd summitted Eisenhower and Monroe but descending their north slopes would have been harder on my knees. Since I couldn't remember exactly what I did nine years ago much of what I saw today seemed new. Thru-hiker ahead as we walk toward Mt. Monroe; I live for views like these! 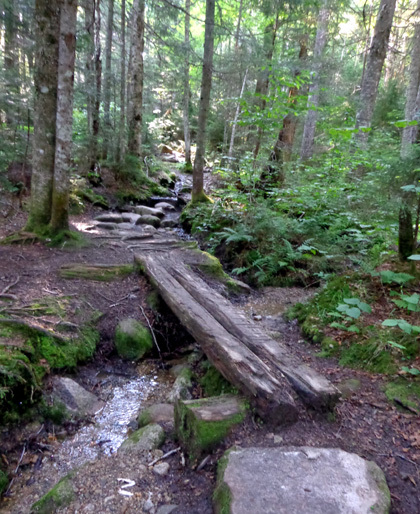 Jim's got the same problem with campgrounds, towns, and trailheads along the Appalachian Trail. 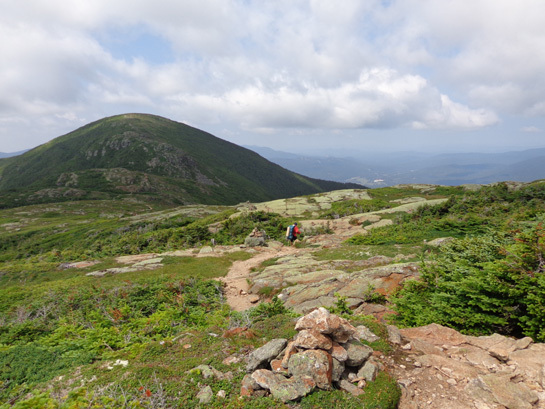 We simply can't remember most of the places where we were in New England during the A.T. trek, either because we were so focused each day on all the things we had to do or because we've been to so many other places since then.